While chemistry might not be your forte, you might want to familiarize yourself with the pH scale when it comes to caring for your leather upholstery. The pH scale is a logarithmic method of measuring the acidity or alkalinity of a solution or material. The scale ranges from 0-14. Within this scale, 0 is known as very acidic, and 14 as very alkaline. A pH of 7 is considered neutral (i.e. pure water). Therefore, anything less than 7 is considered acidic, and anything greater than 8 is alkaline (otherwise known as basic). The majority of manufactured leather is chromium-tanned, placing it around 3.5-5.5 on the pH scale. In other words, most leathers (like the leather decorating your lounge) are acidic. If you’re wondering why this is relevant to you, then consider this: when you combine an acidic substance with an alkaline substance, it will create a chemical reaction (a bit like mixing vinegar and baking soda – which creates a mess of explosive froth). While some reactions are only minor, the severity of the reaction will depend on the degree of differentiation between the substances on the pH scale. A huge amount of household cleaners are alkaline. What this means is that, by cleaning your acidic leather couch with a basic cleaning product, you could be causing a chemical reaction. 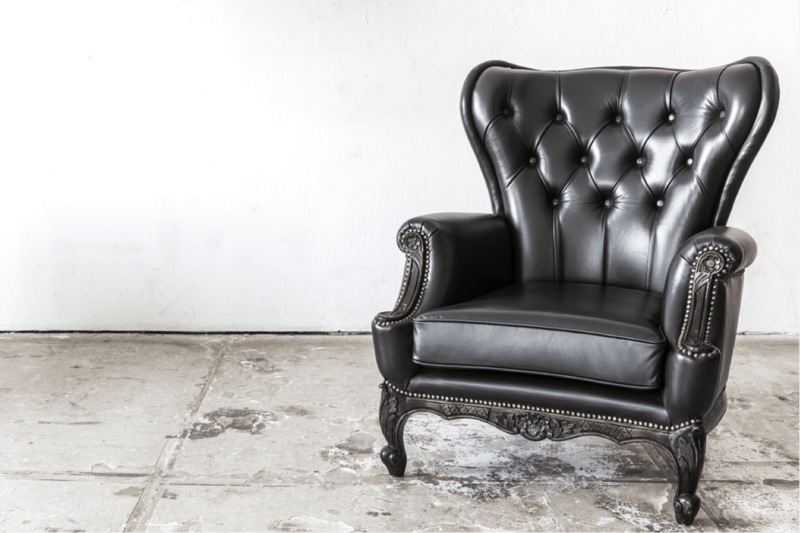 While the reaction might not be quite as pronounced as that of mixing vinegar and baking soda, exposing your leather upholstery to alkaline solutions will eventually cause a breakdown of the leather’s binding fibers. There’s no point investing in genuine leather for its longevity if you’re just going to slowly deteriorate the fabric by using alkaline cleaning products. It may seem counter intuitive that soap is gentle enough to use on our fragile human skin, but damaging to something as resilient as leather; or that the laundry detergent used to clean your clothes isn’t safe to use on your leather upholstery, but just remember – you don’t typically throw your leather jacket in the machine with the other dark-coloured clothing, do you? You can scour the Internet or your local supermarket for hours in pursuit of the best cleaning product for your beloved leather couch, only to find that you probably already have all the ingredients you need to make your very own leather cleaning solution sitting in your cupboard at home. All you need in order to make this internationally recognized cleaning concoction is vinegar, olive oil, and lemon juice. All three of these common household items are naturally acidic (though olive oil cannot be measured on the pH scale as it is not water soluble) and therefore they will not erode leather in any way. While exact ratios vary, you can usually get away with ¼ cup olive oil, ¼ cup of white vinegar, and a few drops of lemon juice. It’s recommended that you spray only minimal amounts of the cleaning solution onto the couch, and buff it into the leather rather than rinsing it and wiping it away. You should also try to avoid using harsh or coarse scrubbing brushes and opt instead for a microfiber cloth. Ammonia is has a pH level of about 12, making it far more alkaline than laundry detergent, which sits at about an 8 on the scale. Because water is neutral, you can dilute the alkalinity of a substance by mixing it with water. This can shift where the solution sits on the pH scale, which is referred to as a buffer solution. Of course, if your couch is badly stained, it may require something more heavy duty than what Mother Nature has to offer, so it’s probably best to seek professional advice or get a leather repair extraordinaire to take a look. While the perfect cleaning solution might not be tucked away in your cleaning cupboard at home, it may only be one phone call away.